Do you have a mess around the KEURIG or coffee maker? There's K Cups and a bottle of honey because we use honey in our coffee instead of sugar. 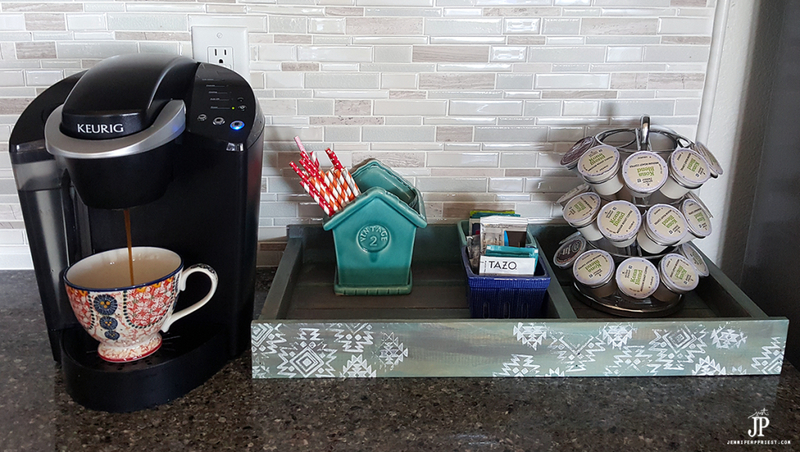 Then there's all of Xaver's tea assortment, the kids' hot cocoa, and the KEURIG itself … it's a MESS! 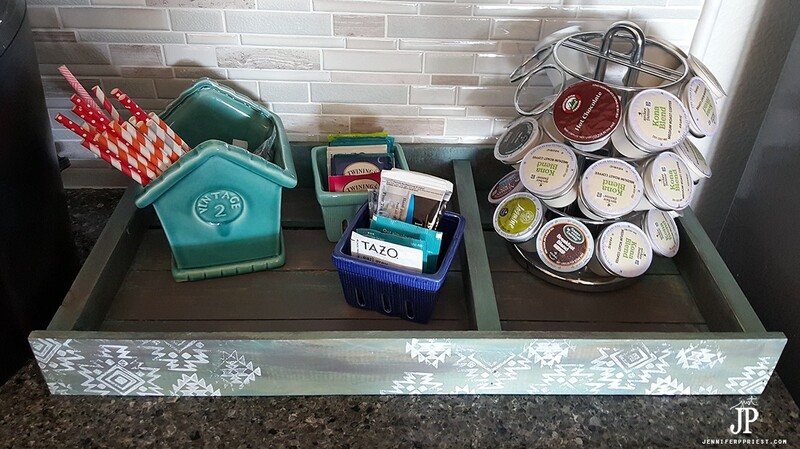 Corral the mess with this fun-to-make DIY Coffee Station using a Wood Tray. The beauty of this project is you can customize it to ANY decor and style. I chose a tribal, Aztec motif but seriously, you can choose whatever color and design you want for this tray. BONUS – the traditional KEURIG machine fits INSIDE this Walnut Hollow Wood Tray! The supplies for this project are available at most craft stores. Walnut Hollow Wood Pallet Tray – I used this specific tray because it fits both the KEURIG machine and the K Cup holder that I have (available at Target). You can use any wood tray but this one does a great job of keeping things compact and all in one spot. Check to see if your tray will fit your coffee accouterments before bothering with painting and decorating it. Wood Tint – I used PLAID FolkArt Home Decor Wood Tint in Cascade (34857) to tint the wood. This gives it a softer, more earthy finish that acrylic paint. Imagine a stain but, it's not really a wood stain. Varnish – You will definitely want to seal this project because it will get coffee, tea, hot cocoa, creamer, boogers, sugar, honey, and whatever else on it from your messy family. Let's face it: our families are messy. I used PLAID FolkArt Home Decor Varnish to seal this tray. Sand Paper – Use the sand paper to smooth the wood before painting and to distress the wood after painting. Acrylic Paint – I used acrylic paint for the stamped design and as an extra layer of distressing to make the paint look chippy, even though the finish is smooth. PLAID Multi-Surface Stain Acrylic paint in Titanium White (2938) is a staple in my craft room and I love to warm gray tones of Delta Ceramcoat Select Multi-Surface Stain Acrylic Paint in Shadow Gray (04037). Wood Block Stamps – these stamps are made for fabric printing but you can totally use them on other projects like this home decor piece. I used the PLAID Fabric Creations Block Printing Stamps in the Medium Aztec Tile Design and the Small Aztec Tile Design. I also used the Fabric Creations Sponge Cubes to apply the acrylic paint to the stamps while stamping. Bristle Paint Brush – for the varnish. Some varnishes will melt foam paint brushes so use a bristle paint brush to apply the varnish. Here's how to make this Coffee Tray for your own home! Sand the tray to remove any rough edges since this tray will be handled alot. Apply PLAID FolkArt Home Decor Wood Tint in Cascade (34857) to the wood to cover. Allow to dry. Apply a second coat of PLAID FolkArt Home Decor Wood Tint in Cascade (34857) to the wood. Allow to dry. Sand away parts of the wood tint to reveal the raw wood. Apply Delta Ceramcoat Select Multi-Surface Stain Acrylic Paint in Shadow Gray (04037) to the exposed wood using a foam brush. Blend with the wood tinted areas of the tray. Allow to dry. Apply PLAID Multi-Surface Stain Acrylic paint in Titanium White (2938) to the Medium Aztec Tile Design and the Small Aztec Tile Design PLAID Fabric Creations Block Printing Stamps using a Fabric Creations Sponge Cube. Stamp randomly onto the front of the tray. Allow to dry. Dry brush the tray with PLAID Multi-Surface Stain Acrylic paint in Titanium White (2938) and Delta Ceramcoat Select Multi-Surface Stain Acrylic Paint in Shadow Gray (04037) for a distressed look. Sand the tray to further distress it. 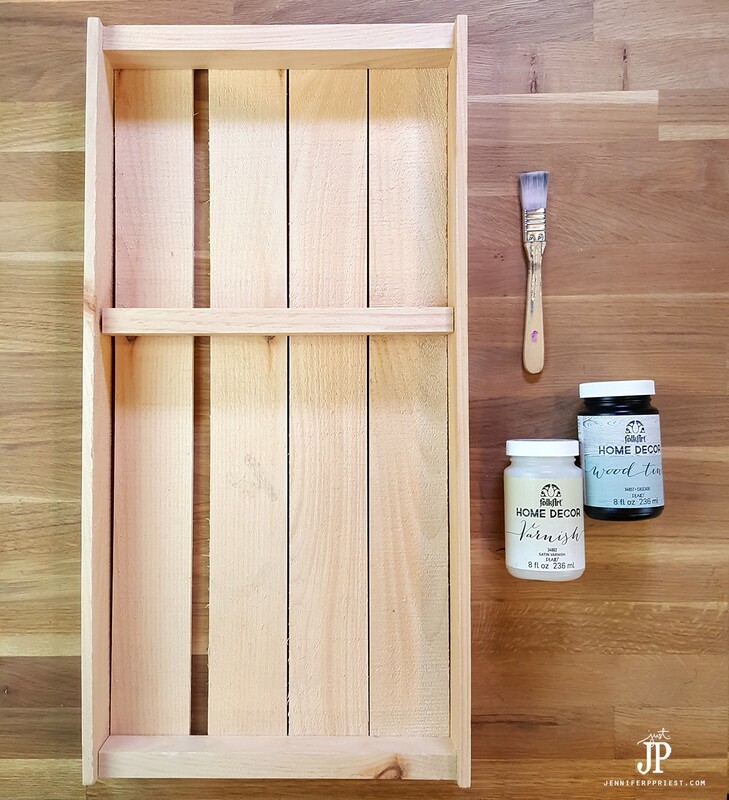 Apply two coats of PLAID FolkArt Home Decor Varnish to seal the tray, allowing the first coat to dry before applying the next. I hope you enjoyed these two projects to make customized and functional home decor with TRAYS! Fill the tray with ceramic cups and baskets to hold tea bags, sugar packets, and more. I got these at Michael's! 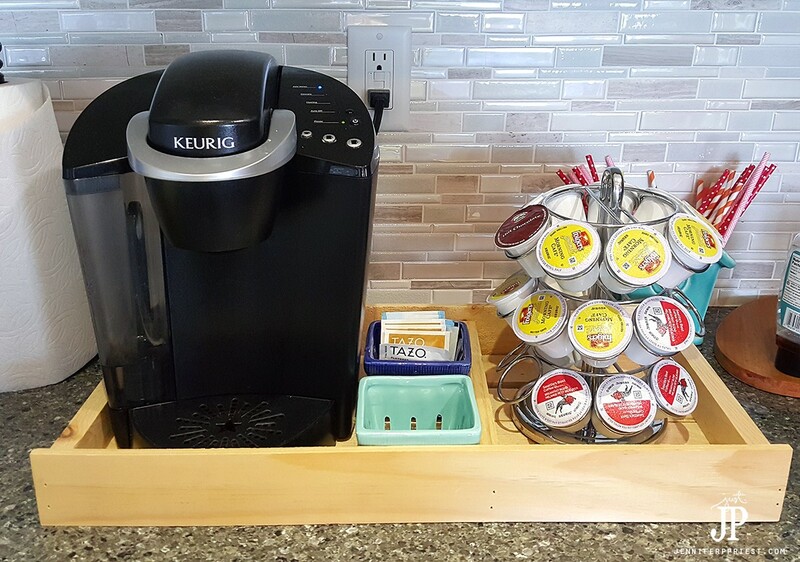 Add a spinner with K Cups in it and the coffee station is ready for use!